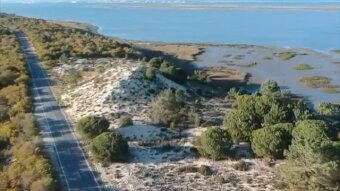 We combined part of the route along the stunning southern coast of Portugal, known as the Rota Vicentina, with the interior Alentejo region to bring you some of the best of Portugal. 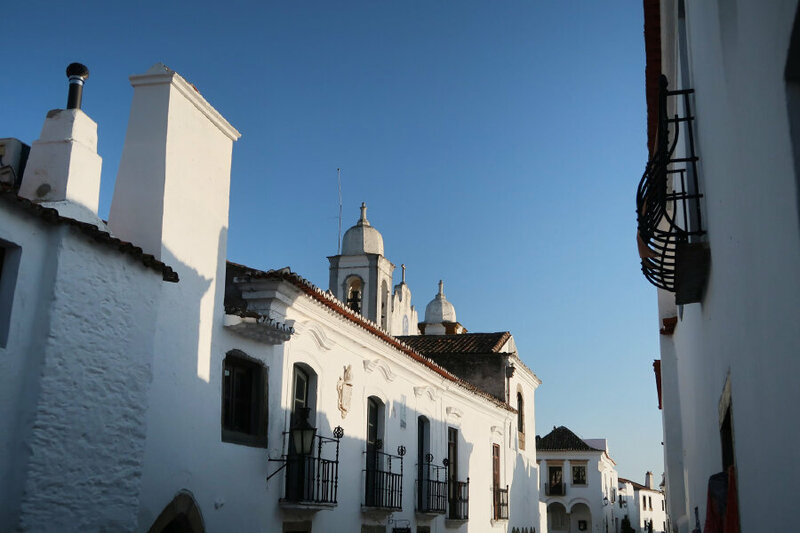 Known for its rural roads, white-washed medieval villages and historic towns built of marble, Alentejo is also the “bread basket” of the country. Join us as we cycle first along the gorgeous coast and then through vast open farmland, cork forests, olive groves and vineyards. Let us help you experience the bounty of beauty that is Portugal! A lot of long rolling hills. Moderate cycling level. Leisurely level with an electric-assist bicycle. Hybrid or road bicycle is included. Fly in and out of Lisbon, Portugal. DAY 1: We’ll meet for dinner, so you can use the day to recover from your traveling and explore the streets of Lisbon on your own. The coastal city of Lisbon is not only the capital of Portugal, but the largest city in the country. It’s also considered to be one of the oldest cities in the world. You’ll surely marvel at the beautiful mosaic pavements throughout the city, as you walk on the works of art crafted entirely of stone. DAY 2: Come to breakfast dressed to cycle, but we will first shuttle out of the city to the historic village of Azeitão. We’ll stop at a small factory where they still make Portugal’s famous blue tiles in the traditional way, copying designs that date back centuries. 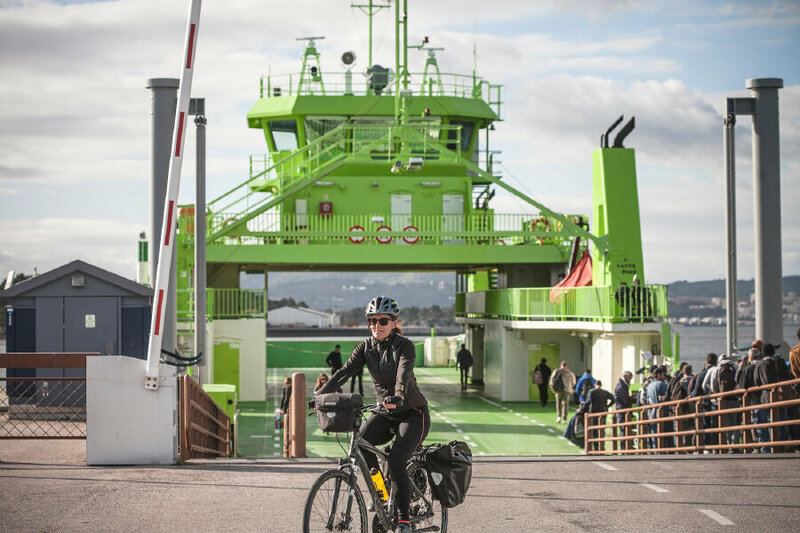 After a tasting in a 19th century winery and lunch, we’ll get on our bikes and head down the breathtaking coastline through Serra Da Arrabida Natural Park. Every hill will reward you with another stunning view of the turquoise sea and white sand beaches. Once in town, you can always head back to a beach before dinner tonight. 17 miles. DAY 3: We start our day with a ferry across the Sado River and then continue south along the Troia Peninsula. This whole area is an estuary full of many protected species of birds. Be sure to look for the stork nests on tops of buildings or for the storks foraging in the rice patties. 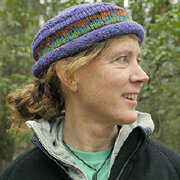 As you cycle, look down for the wild thyme, lavender and Scotch broom growing along the side of the road too. We’ll end our day on the cobblestone streets in Alcácer do Sal. We’ll dine and spend the night in this medieval town’s castle overlooking the river. 29 miles. 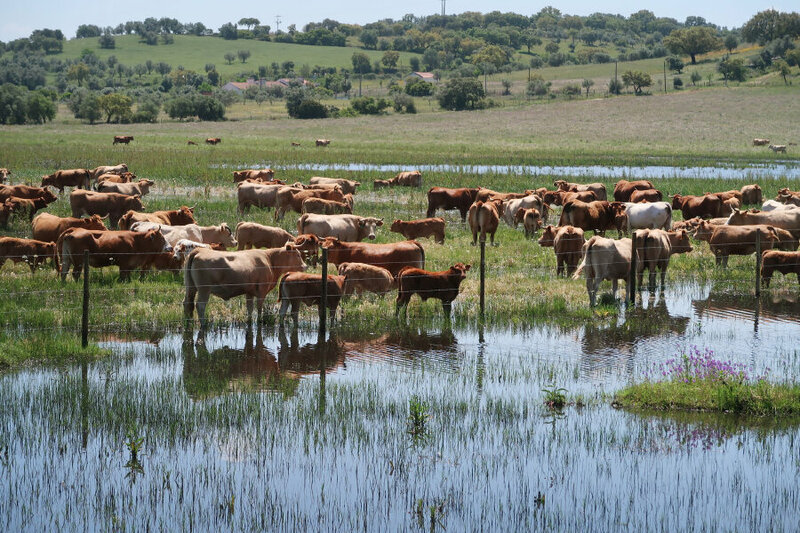 DAY 4: We leave the coast today and head inland to the rolling plains of Alentejo until we reach the UNESCO World Heritage city of Évora. This 5000 year old city full of whitewashed buildings is beautifully preserved. You’ll have time in the evening to wander the twisty narrow streets and imagine what life was like here during the Middle Ages. 46 miles. 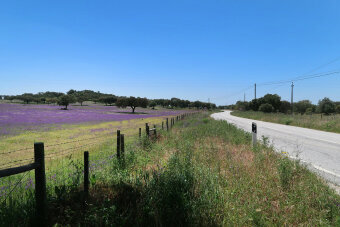 DAY 5: We continue cycling deeper into the peaceful Alentejo countryside today past groves of cork and olive trees. 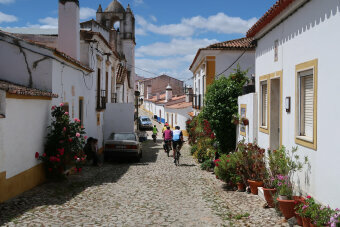 We’ll stop at the small village of São Pedro do Corval famous for its brightly painted handmade pottery. The entire village takes part in producing the gorgeous pieces from clay. We'll end our ride in the hilltop village of Monsaraz at the border with Spain. Somehow time has forgotten this village and it remains little changed since the year 1167 when it was taken over from the Moors. You can watch the sunset over the plains below or get up early tomorrow to watch the sunrise over Spain and the Guadiana River. The views are breathtaking! 40 miles. DAY 6: We start downhill after breakfast this morning and our first stop will be at a standing stone erected about 5000 BC and used in fertility rites. We’ll then stop in the village of Redondo to learn more about how the regional pottery is made. Here it has a charming peasant flair. We'll end the day in the marble village of Estremoz and overnight in a former chapel inside the castle walls. It was built during the 13th century in honor of the Portuguese Queen Elizabeth. When she was observed feeding the poor, she hid the bread beneath her skirt. As the King demanded to see it, the bread miraculously turned to roses and she was eventually ordained a saint. You’ll feel like royalty tonight, even when we have dinner in the former castle jailhouse! 46 miles. DAY 7: Our bike ride today will take us past the quarries where they mine the marble that built these villages. It’s used for everything here – even street curbs. We’ll also pass miles of grapevines as the region is famous for its wine too. 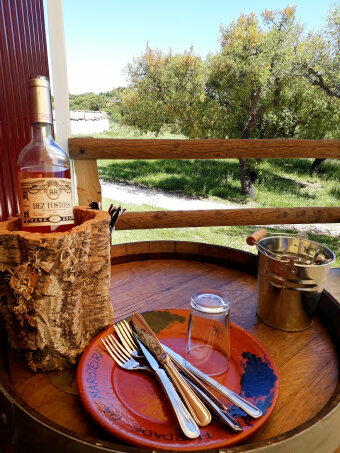 We’ll end the ride back at our castle in Estremoz where dinner is on your own so you’ll have time to relax or explore. 36 miles. 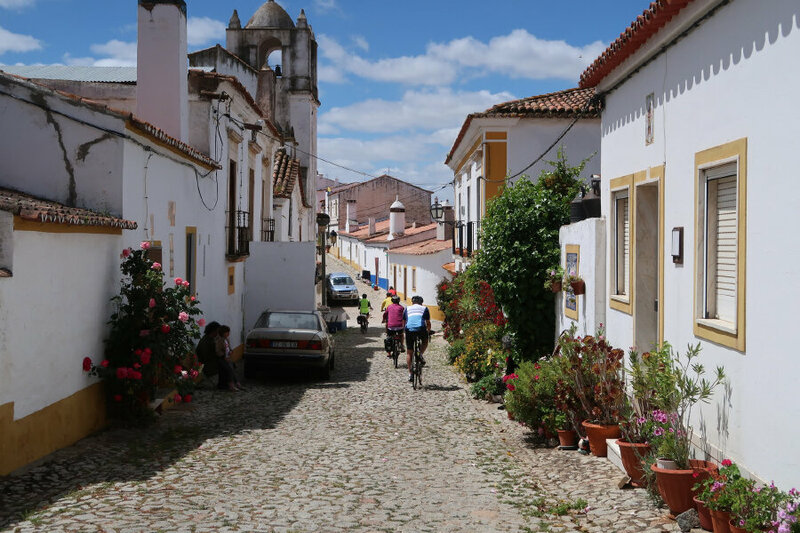 DAY 8: We continue cycling north today into upper Alentejo. We’ll stop at a village known for its thermal springs since the year 100 BC. Next, we’ll stop at the renowned Royal Stud Farm where the graceful Lusitania horses have been bred for royalty since 1748. Buyers come from all over the world for the annual auction. 39 miles. DAY 9: Today we head to Serra de São Mamede Natural Park, one of the prettiest parts of Portugal. The rolling plains give way to low mountains and create a microclimate with beautifully rich and diverse vegetation. We’ll ride (or shuttle) to the town of Marvão at the top of one of these mountains for lunch. 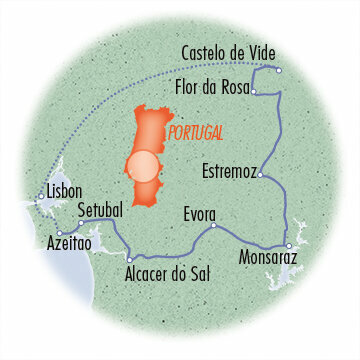 Then we’ll head to Castelo de Vide for the night. We’ll explore its Jewish quarter, visit Portugal’s oldest synagogue dating from the 14th century, and taste water from the famous village fountain, believed to be the best in Portugal for whatever ails you. 36 miles. 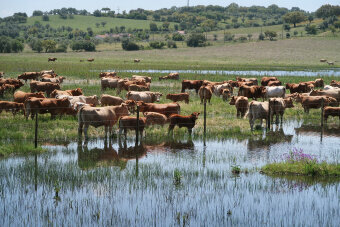 DAY 10: After breakfast, we say good-bye to Alentejo and shuttle back to Lisbon. We’ll stop halfway to visit the whitewashed little town of Arraiolos to see the exquisite needlepoint wool rugs made here. Several artisans in a cooperative usually work on one rug at once, still using centuries old patterns. We’ll have a walking tour of Lisbon before dinner and learn how the city is built on seven low hills and has lovely views at every turn. Even though Lisbon was founded by the Phoencians around 1200 BC, the city suffered a huge earthquake in 1755, so nearly all of it has been built since then. We’ll celebrate our wonderful week at dinner tonight followed by an evening of fado, Portugal’s national music. Fado means “fate” and the beautiful songs speak of longing, love, betrayal and passion. The singers are usually accompanied by a 12-string guitar shaped like a pear and a Spanish guitar. Even though they’re sung in Portuguese, you’ll feel you understand every word, as they’re sung with intense emotion. It will be the perfect ending to a wonderful tour. 0 miles. DAY 11: You’re free to travel at your leisure to the airport for your trip home or elsewhere in Europe. Tchau! 0 miles.